Just a few this month…. Now, before I start, I know this isn’t going to be an popular post but it is relevant to where I am at the moment! I should also so that this isn’t aimed at all the Mum’s I know. Some of them are brilliant and some of them really realise how lucky they are. I read this article in the Family (how ironic!) section of The Guardian today and this woman could have been writing about my own life. Basically she is saying that she is fed-up with hearing women moaning about being mothers and all the problems that come with it, when she is unable to have children. She asserts that to be able to moan about being a Mum is luxury she doesn’t have and therefore it upsets her to hear it. Now, whether you agree with her or not, her viewpoint is valid and I definitely understand it. To hear friends and acquaintances bitching about being tired, bored of being stuck at home, fed up of clearing up sick etc etc is actually tough for me. I would give anything to be in that position, but sadly I am not. To hear someone moaning about the things you most want is tough. “I don’t want to mum-bash, but I do want mums to open their eyes and see what they have. 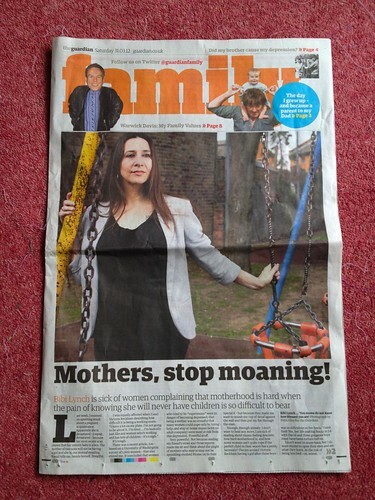 At the risk of being lynched – or, worse, incurring the wrath of Mumsnet Towers … give it a break. Give me a break. Give women like me, who wanted children but don’t have them, a break. You mums do not know how blessed you are – so please just be happy and quit complaining. You got the prize. You have the child. Rejoice. To the writer. Thank you for writing what will undoubtedly be an unpopular article and thank-you for saying all the things that I am unable to say myself. Today has been another beautiful day and this afternoon we had a business meeting. As about half the team was not in the office due to being on training or annual leave, so the rest of us took the decision to relocate our business meeting to the local garden centre tea shop. We sat in outside, drank tea and coffee and talked business. Honest! 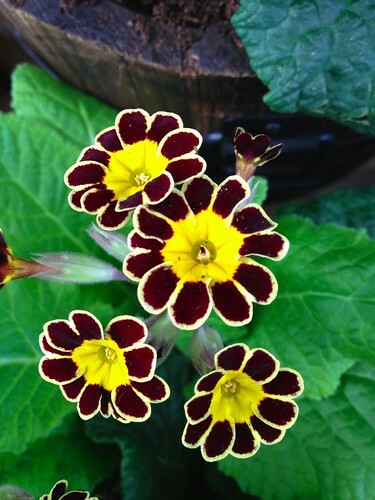 This flower caught my eye because it has the most perfect edging! Lovely, but I suspect the loveliness of the flower wouldn’t last too long. This is the Liberation Mast. It was erected in 2005 to coincide with the 60th anniversary of Liberation Day and the SeaGuernsey festival. It is situated in the middle of the roundabout by the harbour and looks like a boat has been buried! 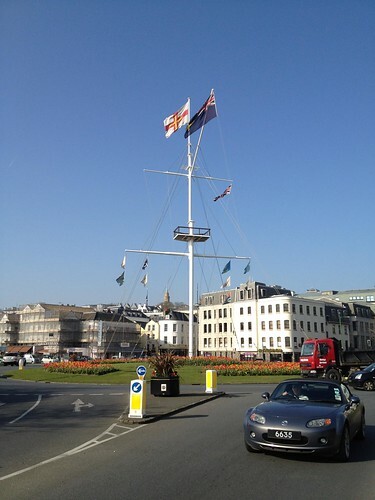 At Christmas the mast is converted into the Guernsey Roundtable Tree of Joy, when fairy-light ropes are run down to the ground so it looks like a tree. It is really effective and there is a nice picture of it here. I know this isn’t the greatest picture in the world, but I only had my iPhone on me today and getting close enough to get a bigger picture would have meant that i would have had to stand in the middle of the road! 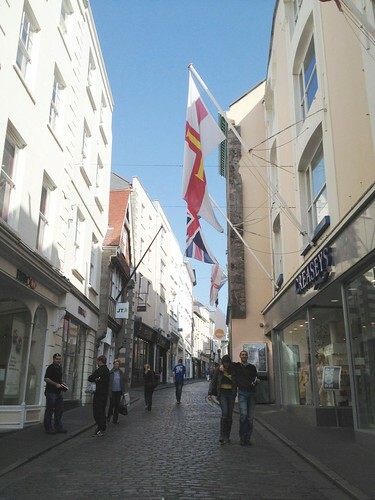 Guernsey doesn’t have exactly the most hip and happening town centre, but it does have a rather quaint little town centre with some lovely old cobbled streets. This is The High Street and the way it looks hasn’t changed vastly over many year. We don’t have lots of high street shops, but it is much better than it used to be and at least we now have a Monsoon! Life is easier ow we can shop online, but even then a lot of major stores won’t deliver to Guernsey. Why!?? It doesn’t cost much more to deliver to the island than the mainland UK. Now, that is annoying. I love this little town, the cute shops, the lovely seafront with the harbour and the expensive yachts bobbing about. Leeds was nice, but this is home. It’s been another gorgeous day here today. Sadly I spent most of it secreted away in an office listening to drug users talk rubbish at me! I have no idea how I am going to cope in the middle of summer when I am just able to look out at the sunshine and not get out there and enjoy it! 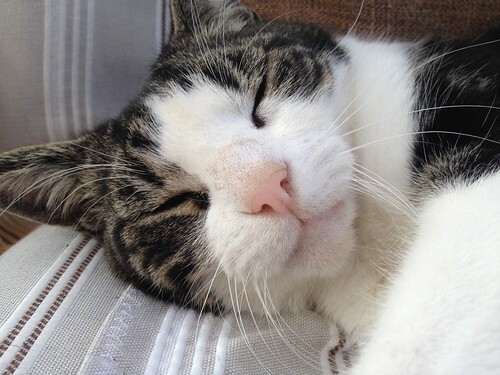 Billy the Cat has been quite poorly. He went right off his food which, as any of you who may have met Billy would know, means he was Proper Poorly. I don’t think he ate for nearly a week which was unheard of! It turned out that he had ringworm so a quick dose of wormer and he has got better since then. He is such a character and we would be gutted to lose him! I kind of forgot about taking a photo today so on my way to choir I popped to the beach and took another photo of the sunset. It was gorgeous. The quality of the light was just beautiful but because I had to rush off I couldn’t stay and see the sun sink even lower and the colour get even more intenser. As I drove away it was even more beautiful. What a privilege to live here. 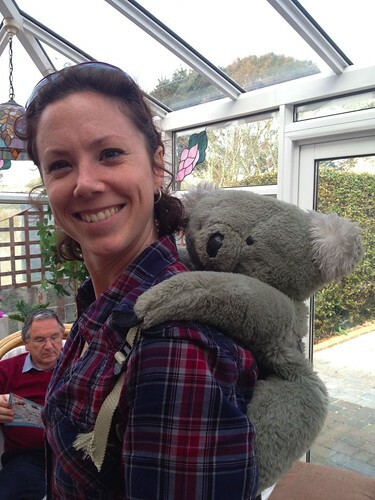 When we were clearing out the attic we came across this koala rucksack that belonged to my sister. She bought it on holiday when she was about 9 years old and wore it incessantly. I remember her spending literally all her pocket money on it and having nothing left for the rest of her holiday. We have loads of photos of her wearing it and she even took it to bed with her. She looks rather pleased to have reclaimed it! 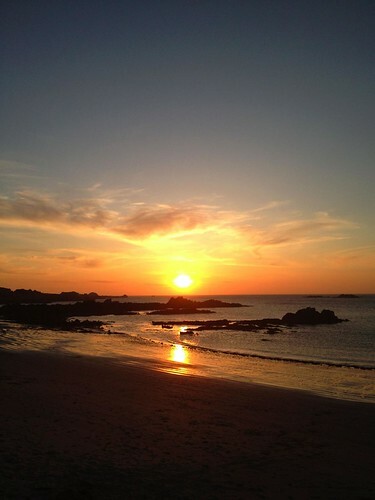 Today has been another gorgeous day in Guernsey and I would like to give you a gorgeous picture of the scenery. The sun has been shining and it has been surprisingly warm. However, we haven’t spent as much time outside as we should have done. 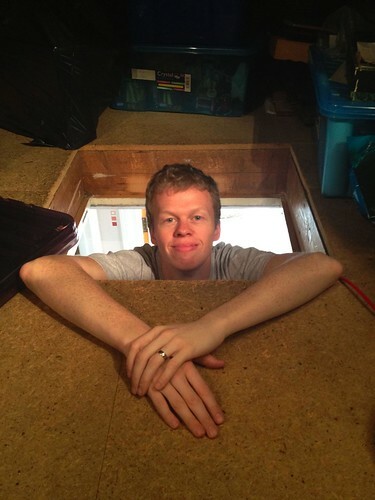 Mum, Paul and I spent all afternoon up in the attic clearing out the stuff has been stashed up there. Some of it has been there for over 10 years (since I lived in Winchester) and there are some of our toys, loads of pictures and just lots and lots of stuff. We cleared out a load of stuff and put some out for a car boot sale. I was really hot up there, so doing it at this time of year was a good plan. It would have been baking up there in August! It has been the most beautiful day in Guernsey, sunny and quite warm and hopefully it is the promise of things to come! On days like this moving to The Rock seems like the best decision ever. 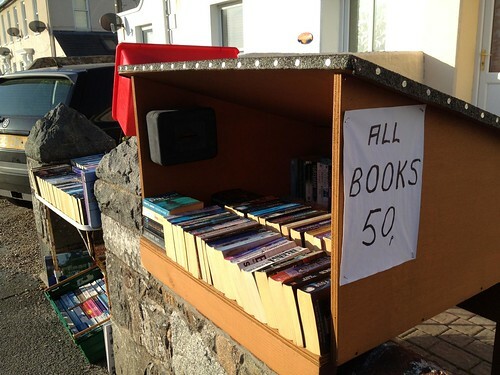 I stopped off at my favourite Hedge Veg stall – one that sells books for 50p. You can’t go wrong with that! this is our Waterstones! !